Jenny Matlock: Painting a few "E's"
I've got my eye on that first one. Maybe when you sell them you can put what size they are, if it's not too much trouble, ha. Great goal. May your Endeavors pay off. You'll have that bike in no time! I must say that first sign really speaks to me right now. It's been a very tough year on the farm, and your sign is a perfect reminder to enjoy all the good things. Jenny - you'd better be copy-writing these signs, or doing whatever it is one has to do to protect one's intellectual property/art. I'm still impress that you did the letters by hand. Is there no end to your creative endeavors? Is there anything you cannot do well? I think not!! awesome work, Jenny. love the words -- do you do other types of paintings? Once again, Jenny, these are just WONDERFUL!!! You will surely have a bike. These are wonderful. They will fly out the door. That's a wonderful goal. I didn't know you were an artist Jenny. So many talents! Loved that first one especially. I love love love the first sign! Wise words to remember! 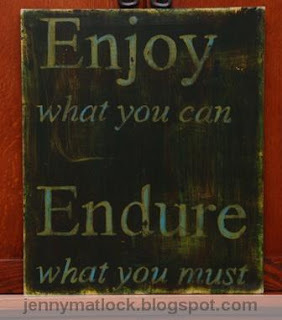 Good quotes, fit perfectly for me, I couldn't participate this time because I enjoy what I can and endure what I must ... I am on a roundtrip through Tunesia with a guide who should better retire ! sign painting inn exchange for a bike! good deal! Not only is your painting extra! 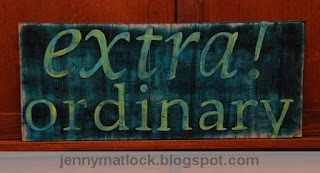 ordinary, I love the words/sayings you choose! Extra impressive! Cheers to your new bike Ms. Jenny! I like these, Jenny. I hope you give all of us a chance at purchasing one! I'm Excited for you that you're selling these to get a bike. I should come up with some goal like that for my Earnings. Maybe I'd be more motivated :-)...somehow "paying the bills" isn't getting me going much these days.